PO APO Guidelines of Conduct of Telangana and AP Assembly Election Videos – PO Hand Book download. Connecting EVM , VVPAT Video 2019 | Moke Poll and Sealing For Elections 2019 - PO Guidelines in AP. Telangana State Parliament Elections and AP Legislative Assembly General Elections 2019 Guideline fof TS Election duty Employees. How to Conduct Mock Polling in TS Assembly General Elections 2019 April 11th. 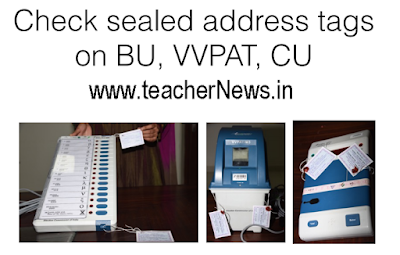 Telangana Election 2019 Connecting EVM, VVPAT Mock Poll and Sealing YouTube (360p).mp4. Telangana General Assembly Elections 2019 After Polling PS and APO Submit Forms, Receipts and Other Material list Download. Telangana Assembly elections presiding officer training Hand Book in Telugu and English. After Poll Submit Receipt, Election Records and Material list at Reception Centres. Election Process Points in the form of Question and Answers Clarify Election Commission. TS Assembly Elections Receipt of Return of Election Records and Material after Poll at Reception Centres. Election Presiding Officers and Asst Presiding Officers have to Conduct Mock Poll before commencement of Polling on the Polling Day after conducting Mock Poll Officials have to seal the Electronic Voting Machine EVM and VVPAT Properly. Most of the Election Staff have doubt on Sealing EVM with Green Seal Special Tag Strip Seal and Step by Step Process to be sealed is here. And after the Election How to Pack the Forms Election Material in different category of Packets here are the details. During Election Time POs and APOs have to perform many duties and have many responsibilities from the Day Before Election to the end of election duty on the next day evening. It is natural that there arises many questions related to the duties and responsibilities that they have to perform during those 2 days. It is very important to have a good knowledge on the process of Election Duties performed on that respective day. For that the POs and APOs have to go through the module given at Election Duty Training Programme. Connecting EVM , VVPAT Video 2019 | Moke Poll and Sealing For Elections 2019 of AP Assembly Election Videos – PO Hand Book download. Telangana Parliament elections presiding officer training Hand Book.